Have you ever longed to pick up your expensive, high performance Samurai sword and run amok through the woods stabbing, cutting, chopping and hacking every inanimate object in sight without the fear of losing all your hard earned money by damaging it? That's why we created the two handed Katana Machete. It offers a 19 in. long blade with a modified Tanto style point. 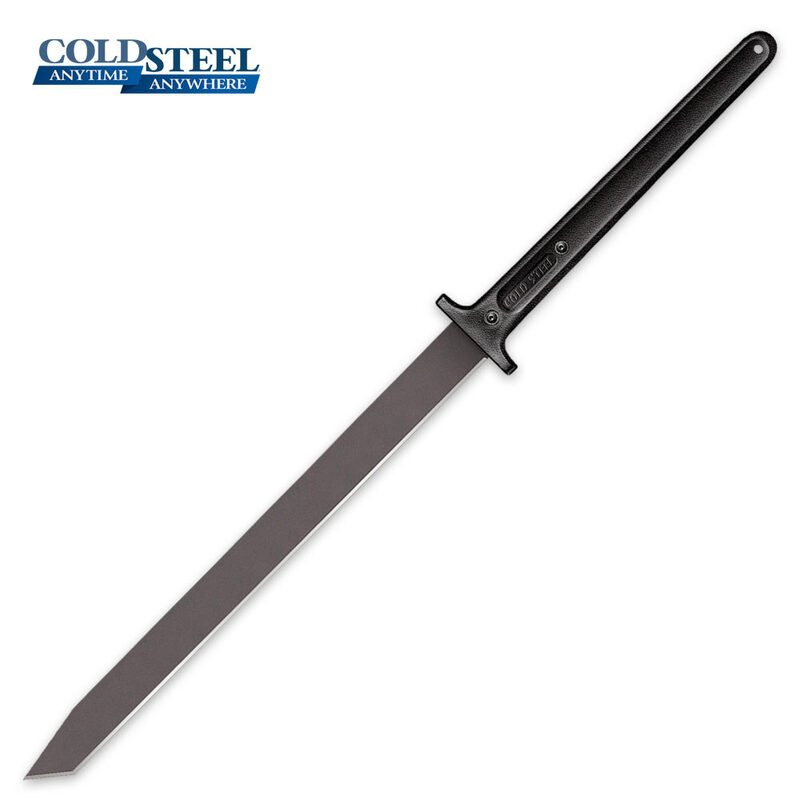 Heat treated to a tough spring temper and sporting a black, baked-on anti-rust finish, it comes with a good utility edge that can easily be fully sharpened. To facilitate one or two-handed use, we have paired the blade with a long handle, complete with a sturdy cross guard. Injection molded over the blade's tang, and further secured by two thick bolts, it shrugs off hard knocks and defies the elements. Overall Length: 35 1/2 in. Handle: 16 1/2 in. Long Polypropylene. Also available: Katana Machete Sheath w/ Back Strap. If your looking for a TOTLEY AWESOME and PRACTICAL utility sword. Then this is for you! I have owned my 97THK for 2 years now and it's still kicking @ss. I have used this sword in splitting small logs, throwing and abused the crap out of this sword. I do hand sharpen my 97THK every once in a blue moon but it takes a lot use to make this sword doll. good quality blade. i cut 6 off the handle to make it more versatile, even though it voids the warranty by doing so. plan on buying and selling more of these. Overall a limited blade and generic sheath. The factory edge was done on a grinding wheel probably and left an inconsistent serrated type edge. Tang should have been much thicker for the length of blade giving a weakness to bend. Ok for the price but..
All I can say is wow. Every time I pick up this weapon I feel unstoppable now I'm ready for the zombie end of days lol but seriously Best sword/machete combo there is nothing it won't devour in its path. Great price awsome deal. Thank you budk this was my first purchase and won't be my last.